Read the Geotimes poll results on winter heating. Next month, Geotimes explores the world of fossil hunting. Have you ever collected fossils or rocks as a hobby? 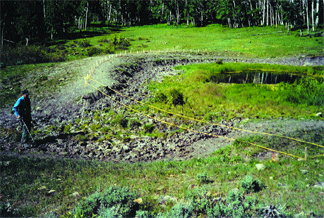 The use of geologic materials for solving criminal and civil cases has existed for 100 years. With one man shot dead and another seriously injured at a boat landing in Virginia, the police turned to a soil expert to help crack the case. Salted mine piles, precious-metal hoaxes and false testimony  a former investigator for the U.S. Securities and Exchange Commission shares his favorite stories. Nearly three months after a large oil spill offshore Tacoma, Wash., investigators are still trying to identify the source. Counter-bioterrorism research is leading to the development of a new generation of technology for detecting life on the Red Planet. For 40 years, astronauts have been prepping for their extraterrestrial terrains and orbital missions by learning about geology down on Earth. Forensic geology can be a powerful hook to pull people into the scientific world. The new members of Congress will join the ranks this month in shaping national policies on energy and the environment. Finding a permanent storage site for the nation's nuclear waste is a problem of mountainous proportions. Soils can provide valuable evidence in linking a suspect to a crime. In Front Royal, Va., for example, forensic geologists helped place a man at the scene of a murder by comparing the mud on his Jeep to mud from the crime scene. Forensic geologists can also help investigate cases involving explosions, intelligence data and mining fraud. 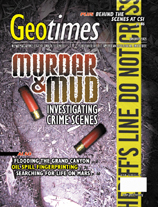 Read more about forensic geology throughout the issue. Image created by Mark Shaver. Get your copy of the 2005 AGI Publications Catalog! E mail jr@agiweb.org for more. Visit the Geotimes archive to search for past stories.